As well as selling pre-made pieces, I can be hired to do a collaborative or custom piece. 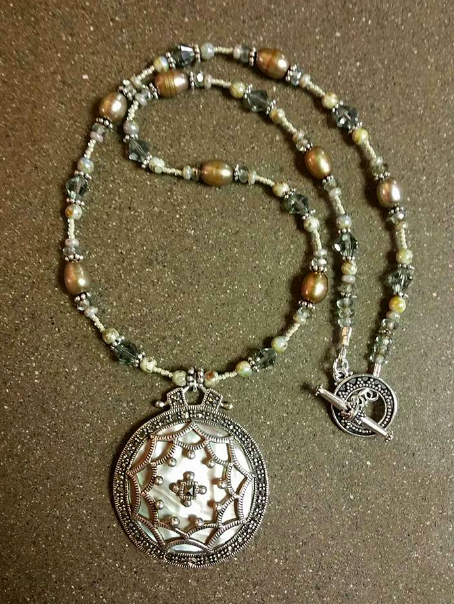 This client had a beautiful mother of pearl, marcasite and sterling silver pendant she wanted made into a special necklace. We made this piece together in a collaborative jewelry making session using freshwater pearls, fire-polished glass Czech beads, Japanese seed beads, and Swarovski crystals. Book a collaborative jewelry session today. I can be reached at 949 648-1109.